A fascinating case sure to disturb both ET believer and skeptic alike, namely, that what crashed may have been representative of an independent postwar Nazi power, an extraterritorial Reich monitoring its old enemy, America, and its continuing developments of the very technologies it confiscated from Germany at the end of the war. USA: President Roosevelt orders that no American can export gold without government authorization. CBI - China: Day 110 of 142 of the 1st Battle of Hebei. Spain: Day 278 of 985 of the Spanish Civil War. Two Anarchist battalions, dissatisfied with the Republican Government, go on strike, leaving a 15-mile gap in the battleline. Spain: Day 643 of 985 of the Spanish Civil War. CBI - China: Day 288 of 2,987 of the 2nd Sino-Japanese War. Day 73 of 124 of the Battle of Henan. Day 28 of 39 of the Battle of Xuzhou. CBI - China: Day 653 of 2,987 of the 2nd Sino-Japanese War. Day 35 of 54 of the Battle of Nanchang. Day 1 of 35 of the Battle of Suizao. ETO - Denmark: The Danish Army begins to demobilize. Hitler authorizes the creation of a joint Norwegian-Danish-German SS regiment. ETO - Norway: Day 12 of 63 of the Battle of Norway. At Namsos, the Luftwaffe destroys large quantities of British supplies and equipment piled near the docks, leaving the British little to fight back with. Germany: The German High Command issues a secret order to discharge all servicemen with mixed Jewish heritage and those who are married to Jewish women. CBI - China: Day 1,019 of 2,987 of the 2nd Sino-Japanese War. Day 158 of 381 of the Battle of South Guangxi. Atlantic: Erich Raeder tries to convince Hitler to allow German subs to attack American ships. Hitler rejects this, citing his unwillingness to provoke the Americans to fully enter the war. Atlantic: German sub U-73 sinks the British ship EMPIRE ENDURANCE 400 miles west of Ireland. This was formerly the German ship ALSTER which was caught in Norway last year. Atlantic: The British anti-submarine trawler HMT TOPAZE is accidentally rammed by the British battleship HMS RIDNEY and sinks in the Clyde Estuary, Scotland. ETO - UK: Day 227 of 258 of the Blitz. Another 449 people are killed. MTO - Greece: Day 15 of 25 of the Battle of Greece. The Luftwaffe bombs Athens and Piraeus. The Greek destroyer PSARA is sunk. UK troops withdraw from Mt Olympus toward Thermopylae. MTO - Albania: The Greek Epirus Army surrenders to the Germans without authorization. Mussolini files a protest, saying that the surrender must be accepted by an Italian general. MTO - Libya: Day 11 of 256 of the Siege of Tobruk. East Africa: Day 315 of 537 of Italy's East African campaign in the lands south of Egypt. CBI - China: Day 1,384 of 2,987 of the 2nd Sino-Japanese War. CBI - Thailand: Day 202 of 221 of the Franco-Thai War (Vichy France vs Thailand). Atlantic: Day 97 of 169 of Germany's Second "Happy Time," during which U-boats sink 609 Allied ships with little risk. U-752 sinks the US freighter WEST IMBODEN east of Boston, Massachusetts. ETO - France: An assassination attempt on Jacques Doriot, leader of the French Fascist organization, fails. French PM Laval quickly voices a need for increased Franco-German friendship. Germany: German Jews are banned from using public transportation. Russian Front - North: Day 225 of 872 of the Siege of Leningrad. Russian Front - North: Day 72 of 102 of the Battle of the Demyansk Pocket, another failed attempt to break the siege at Leningrad. Russian Front - North: Day 88 of 103 of the Battle of the Kholm Pocket. Another attempt to break the siege at Leningrad. Russian Front - Center: Day 103 of 103 of the Battle of Vyazma, Russia. The Soviets take Vyazma forcing the German troops to retreat further away from Moscow. Russian Front - Center: Day 103 of 103 of the Battle of Sychevsk, Russia. The Soviets take Sychevsk forcing the German troops to retreat further away from Moscow. Russian Front - Center: Day 49 of 49 of the Battle of Rzhev, Russia. The Soviets take Rzhev forcing the German troops to retreat further away from Moscow. Russian Front - South: Day 173 of 248 of the Siege of Sevastopol, Crimean Peninsula. MTO - Malta: The USS WASP delivers 46 Spitfires to Malta. Unfortunately, most of them will be destroyed on the ground within three days by Luftwaffe attacks. CBI - Burma: Day 128 of 164 of Japan's Invasion of Burma. Japanese troops capture Taunggyi, the capital of the southern Shan states. In central Burma, Japanese and Chinese troops clash at Loikaw. CBI - China: Day 1,749 of 2,987 of the 2nd Sino-Japanese War. PTO - Japan: As a result of the Doolittle Raid, the Japanese decide that Operation MI (invasion of Midway Island) must take place as soon as possible, while plans to capture Samoa, Fiji and New Caledonia are postponed. PTO - Malaya: Day 61 of 357 of the Battle of Timor Island. PTO - Philippines: Day 134 of 152 of the 1st Battle of the Philippines. 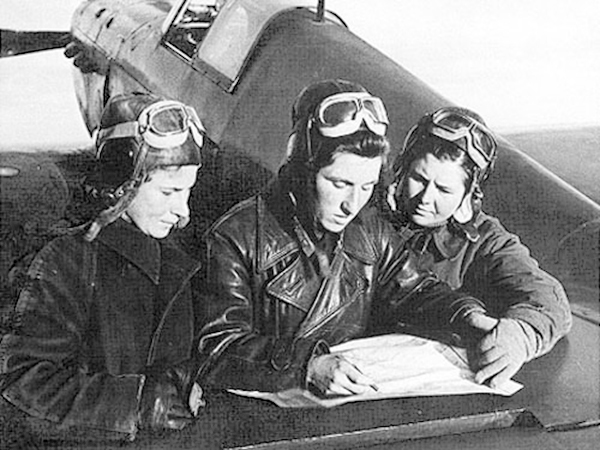 Russian Front: Soviet Air Force pilots Yekaterina "Katya" Budanova and Lydia Litvyak, two of very few female fighter aces, are featured on the cover of the Soviet weekly young adult political-literary publication Ogonek. Ogonek featured a cover photo of Katya Budanova and her close friend and fellow ace pilot Lydia Litvyak. An article detailed their accomplishments, honoring, in true Soviet style, their collective, rather than individual achievements. The magazine gave a combined number of combat missions and kills to date for the two pilots. USA: The US announces that their airmen captured in the Doolittle Raid on Tokyo have been beheaded by the Japanese. UK: The British government announces a limited recruitment for women to serve in the Home Guard. Switzerland: A World Jewish Congress representative in Geneva outlines a plan to borrow local currency in Romania and France for efforts to rescue Jews in those countries. Germany: The Jewish uprising in Warsaw triggers a massive German response and initiates a month long massacre of the 60,000 Jews living in the ghetto. Russian Front - North: Day 590 of 872 of the Siege of Leningrad. Russian Front - North: Day 351 of 658 of the Siege of the Kholm Pocket. MTO - Tunisia: Day 155 of 178 of the Battle of Tunisia. RAF and US Air Forces provide Allied air support. The British 8th Army captures the Enfidaville Airfield. MTO - Tunisia: Indian Army Company Sergeant Major Chhelu Ram is wounded in the Battle of Tunisia while rescuing his commanding officer. He then leads a successful hand-to-hand assault in which he is wounded again, this time mortally. 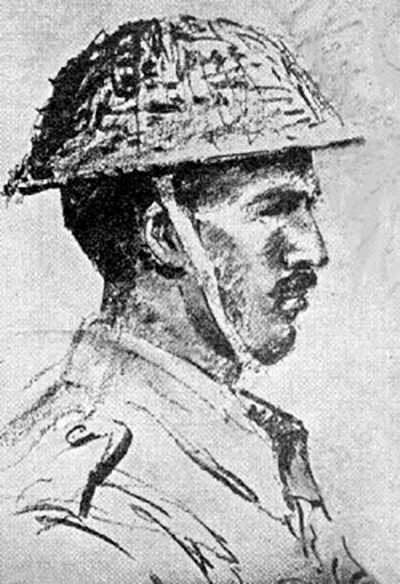 He is posthumously awarded the Victoria Cross. The Indian Army began the war in 1939 numbering just under 200,000 men. By the end of the war it had become the largest volunteer army in history, rising to over 2.5 million men in August 1945. Serving in divisions of infantry, armor and a fledgling airborne force, they fought on three continents in Africa, Europe and Asia. Over 36,000 Indian servicemen lost their lives during WWII, while another 34,354 were wounded and 67,340 became prisoners of war. 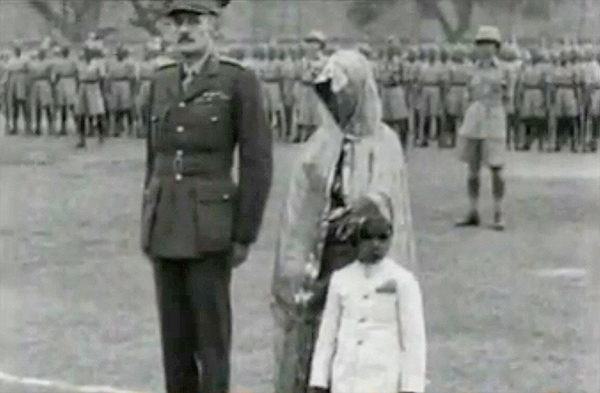 Their valor was recognized with the award of some 4,000 decorations, and 38 members of the Indian Army were awarded the Victoria Cross or the George Cross. CBI - Burma: Day 72 of 79 of the Allied Operation LONGCLOTH. US 10th Air Force provides air support. Japanese troops attack the British Maungdaw-Buthidaung line. CBI - China: Day 2,114 of 2,987 of the 2nd Sino-Japanese War. PTO - Alaska: Day 318 of 435 of the Battle of Kiska, Aleutian Islands. US 11th Air Force attacks Kiska Island. PTO - Gilbert Islands: US 7th Air Force B-24s bomb at Tarawa. PTO - Japan: The USS SCORPION sinks the Japanese converted gunboat MEIJI MARU No 1. PTO - New Guinea: US 5th Air Force attacks at Wewak, Nubia and Boram. ETO - France: US 9th Air Force B-26s and A-20s attack targets at Etaples, Bazinghen, Villerville, Gravelines, Fecamp, Poix and V-weapon sites in the Pas de Calais area. Russian Front - North: Day 79 of 191 of the Battle of the Narva Isthmus, Estonia. Both German and Soviet troops remain in their defensive positions. Russian Front - South: Day 13 of 35 of the Battle of the Crimea. Russian Front - South: Day 13 of 60 of the Battle of Romania, 1st Jassy Offensive. MTO - Algeria: The US Liberty Ship SS PAUL HAMILTON, loaded with men and explosives, is hit by an aerial torpedo off Algiers and blows up into pieces with no survivors. MTO - Italy: Day 95 of 123 of the Battle of Monte Cassino. RAF and US Air Forces provide air support. The German Gustav Line continues getting weaker. MTO - Italy: Day 90 of 136 of the Battle of Anzio. RAF and US Air Forces provide air support. CBI - Burma: Day 47 of 166 of the UK's Operation THURSDAY. CBI - Burma: Day 42 of 147 of the Battle of Myitkyina. US 10th Air Force provides air support. CBI - Burma: Day 20 of 302 of the Chinese Salween Offensive. US 14th Air Force provides air support. CBI - China: Day 2,480 of 2,987 of the 2nd Sino-Japanese War. Day 4 of 259 of Japan's Operation ICHI-GO. Day 4 of 39 of the Battle of Central Henan, the first offensive in Japan's Operation ICHI-GO. CBI - India: Day 44 of 118 of the Battle of Imphal-Kohima. The Japanese begin to lift their siege at Kohima. PTO - Marshall Islands: US 7th Air Force bombs at Wake and Peale Islands and at the Maloelap and Jaluit Atolls. PTO - New Guinea: Day 52 of 80 of the Battle of the Admiralty Islands. 5th Air Force provides air support. PTO - New Guinea: Day 215 of 219 of the Battle of Shaggy Ridge. 5th Air Force provides air support. PTO - New Guinea: Day 128 of 597 of the Battle of New Britain. US 13th Air Force provides air support. PTO - Solomon Islands: Day 172 of 295 of the Battle of the Bougainville Islands. US 13th Air Force provides air support. UK: British figures show that thus far, 60,585 British civilians have been killed and 86,175 have been seriously injured by air attacks since outbreak of the war. ETO - France: Day 265 of 284 of the Battle of Brittany. ETO - France: Day 218 of 236 of the Siege of Dunkirk. ETO - Germany: Day 46 of 46 of the Battle of the Ruhr Pocket. The fighting finally comes to an end, marking the end of all major organized resistance on Nazi Germany's Western Front. ETO - Germany: US 7th Army captures Nuremberg while the French 1st Army captures Stuttgart. Germany begins evacuating their civilians from Helgoland Island after sundown, which was ordered after yesterday's bombing attack. ETO: US 8th Air Force bombs in Berlin, Bavaria and Czechoslovakia. Germany: Between 13,500 and 15,000 prisoners begin being transferred from Buchenwald and Gross-Rosen subcamps to the Theresienstadt Concentration Camp over the next 20 days. Germany: Hermann Goering destroys his lavish Karinhall estate near Eberswalde, loading all his plundered treasures onto 24 heavy trucks and several train cars. Germany: The German OKW moves from Zossen, outside Berlin to Mürwik in northern Germany to escape the approaching Soviet forces. Hitler refuses to go with them. Russian Front - Finland: Day 218 of 223 of the Lapland War. Finland and Russia have joined forces to kick the Germans out of Finland's most northern province. Russian Front - Center: Day 188 of 206 of the Battle of the Courland Pocket in Latvia. Russian Front - Center: Day 8 of 13 of the Battle of Zemland, East Prussia. Russian Front - Center: Day 5 of 23 of the Battle of Settin-Rostock, both sides of the border between Germany and Poland. Russian Front - Center: Day 5 of 17 of the Battle of Berlin. Soviet artillery begins to rain on Berlin as a gift for Hitler's 56th (and last) birthday. Russian Front - Center: Day 67 of 83 of the German Siege of Breslau (today Wroclaw, Poland). The Soviets continue with their siege. MTO: US 15th Air Force bombs targets in southern Germany, Austria and northern Italy. MTO - Italy: Day 2 of 5 of an assault by the 442nd Infantry Regiment of Nisei Japanese-Americans against German fortifications on the Gothic Line in Tuscany. MTO - Italy: Day 15 of 27 of Operation GRAPESHOT, a successful offensive in northern Italy. The Allied Air Forces hit targets in effort to hinder the supply or withdrawal of enemy troops. MTO - Italy: Day 12 of 13 of the Battle of Bologna. German troops begin to withdraw. CBI - Burma: Day 76 of 99 of the Battle of Pakokku and Irrawaddy River operations in central Burma. CBI - China: Day 2,845 of 2,987 of the 2nd Sino-Japanese War. Day 20 of 91 of the Battle of Zhijiang. US 14th Air Force provides air support. Day 12 of 60 of the Battle of West Hunan (near Zhijiang). PTO - Bonin Islands: US 7th Air Force bomb at Haha Jima Island. PTO - Formosa: US 5th Air Force bombs the airfields at Tainan and Koshun. PTO - Japan: Day 20 of 83 of the Battle of Okinawa. PTO - New Guinea: Day 480 of 597 of the Battle of New Britain. US 10th Air Force provides air support. PTO - New Guinea: Day 364 of 481 of the Battle of Western New Guinea. US 10th Air Force provides air support. PTO - Philippines: Day 183 of 299 of the 2nd Battle of the Philippines, aka the Liberation of the Philippines or the Philippines Campaign. PTO - Philippines: Day 127 of 244 of the Battle of Luzon. 5th Air Force provides air support. US Army troops land on Catanduanes. PTO - Philippines: Day 42 of 159 of the Battle of Mindanao Island. 5th Air Force provides air support. PTO - Philippines: Day 34 of 135 of the Battle of the Visayas region. US 5th and 7th Air Forces provide air support.